Type designer David Quay is fascinated by urban typography and how cities use typefaces to express their individual identities. Describing himself as a ‘Type Tourist’, David has visited and extensively photographed the type styles that characterise many cities across the world. He has recently started to share his knowledge and experience by offering type tours of cities. Each city is unique typographically. The Johnston typeface, originally designed for the London Underground, is now used on street signage – effectively becoming the typeface DNA of London. Amsterdam has two DNA typefaces: the café lettering painted by signwriter Leo Beukeboom, and the cast metal letters (in the Amsterdam School type style designed by Anton Kurvers) used to label over a thousand bridges. Barcelona, Berlin, Paris and Valencia (with its ceramic tiles) all have their particular characteristic letterforms. 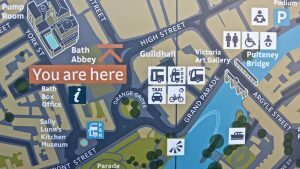 During his talk David will also discuss his work on a recent custom wayfinding typeface project for Bath: the Bath City typeface. The typeface required extensive documentation of the city’s lettering. Originally from London, but now based in the Netherlands, David Quay is a graphic designer, type designer, typographer and teacher. Originally from London, he is now based in the Netherlands. David is one of the principals of The Foundry, a UK-based type design partnership he co-founded with Freda Sack in 1989. Their commissions have included: a directory typeface to be readable at very small sizes for the Yellow Pages (awarded a D&AD Silver); corporate fonts for BG plc (British Gas) and NatWest bank; and signage typefaces for clients in the UK. David has had a long association with the London College of Printing (now London College of Communication). He has been a visiting lecturer at Denmark’s Designskole Copenhagen, and at the Hochschule für Gestaltung Offenbach. For three years he was Professor of Typography and Book Design at the Fachhochschule Mainz. David was one of the founder members of Letter Exchange, and was its chairman for many years. He was elected a Fellow of the International Society of Typographic Designers (ISTD) in 1992 and was joint chair of the Society from 1994 to 1999.